I have some renewed enthusiasm to curate useful resources for Google Tools in the classroom since the recent introduction of Chromebooks at my school. So I have updated the Google site I began a while ago. It is an area that is hard to keep up to date but I find the process of collecting and organising the resources worthwhile as it makes me evaluate them and sort them and the fact that many resources are in the one place certainly helps me in my work. With so many tools at our fingertips, I am wondering where to start. 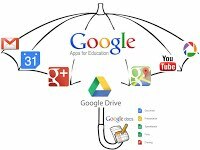 Our students have already got their heads around Google Drive but as with all things there are many opportunities to learn. I think I will ensure that they are introduced to the flexibility of Chrome as some immediate efficiency measures can be very worthwhile and quite engaging as well. This morning, I am feeling a sense of community, curiosity and creativity : combined with a little bit of travel weary, end of term exhaustion. 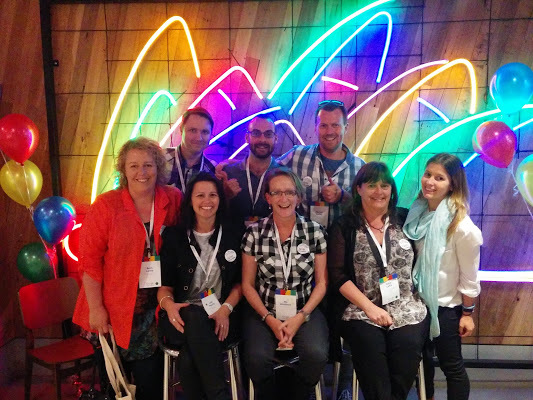 These were the themes of the mentor presentations at the Google Teacher Academy I attended during this whirlwind week, which began with sharing the Google Apps for Education Summit with 10 of my school colleagues and 400 other teachers in Melbourne. The GTA experience this year was facilitated by Tom Barrett and Hamish Curry from NoTosh, leading us through the Design thinking process. Thankfully we had been slowly immersed in the process and our ideas by connecting to our Teams in the weeks prior – being introduced and starting the conversations that would lead to much discussion, work and deliberation. If you came to the GTA expecting to come away with a whole heap of Googley technical skills you would have left disappointed. If you came expecting to be a passive learner, you would have been very challenged. If you came along to see how community, curiosity and creativity can be enacted, you would be very happy. The process was outward looking, in that,we all had been asked in the month or so leading up, to consider a ‘Moonshot thinking’ exercise from our own context. We were guided through many steps that had us thinking, questioning, giving feedback, re-thinking, ideating and then developing an idea through to an action. Many people found connections between their ultimate Moonshot questions – in fact in reading them I found connections everywhere. We are all challenged to continue the process and take actions back in our wider communities. Hexagonal thinking which I had explored a little beforehand, proved to me to be one of the most powerful ah-ha moments! I witnessed the struggling in others and in my own thinking but the strong links it can provide and yet the flexibility it can enable. I loved hearing Annie Parker from Muru-D discuss entrepreneurial hacks and then Brett Morgan, a Google Developer Relations engineer discuss the Design process and seeing such strong links in the ideas and the process we were experiencing. All this taking place in such a ‘cool’ environment as the Google Office space. I am presenting at the Melbourne GAFE (Google Apps for Education) Summit this week. I have never felt very confident as a speaker but recent experiences are encouraging me to extend beyond my comfort zone. So here I find myself the afternoon before, adding, taking, tweaking for the millionth time my presentation for tomorrow. I have chosen a topic that I hope provides a good balance on theory and practice. I know people like to come away with new skills but I also believe any skill / tool should be used with good purpose. The subject is basically using Google tools to create opportunities to have learning conversations – teacher/student, student/student, student/parent, student/other stakeholders etc. The opportunity to provide feedback / feedforward throughout the learning process instead at the end. I am finally prepared to present. I will probably write more once it is done – phew !